Academics do take themselves seriously, do they not? In my experience the shakier the ground the academic stands upon and the greater the level of their pomposity, as if shouting loudly from a gilded pulpit is going to make a questionable subject more reliable. Don’t get me wrong, I know many academics and many of those have my deep admiration, but there are those whose treatises owe more to the size of their ego than the veracity of their research. To my mind, one of the most dubious must be “management science” which is not “science” in any way which I understand it. It does not propose a hypothesis which can be tested independently. Nor does it conduct repeatable experiments, if at all, and never with a control group. Rather it reports selective analyses of past events. That, to me, is history not science and although we can learn a lot from history, it informs our decisions in a very different way from science. The management gurus and their iffy theories and overpriced books, should come with a warning. Something to burst their bubble, to point out to the poor reader, or newly destitute attendees of the their exorbitant lectures, that not all is quite as rosily predictable as they claim. Strangely, Oxford and Cambridge Universities used to have such a role. In Cambridge it was the “prevaricator”, in Oxford the Terrae Filius (son of the earth). Until 1783 the Terrae Filius would enliven the Encaenia (the annual event at which honorary degrees are awarded). Until 1689, the Encaenia was held at the University Church of St Mary the Virgin. 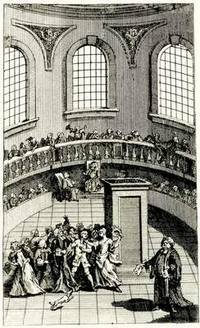 So shocking were these biting monologues that the new Sheldonian Theatre was built so that the often ribald, secular ceremonies would no longer be held on consecrated ground. Diarist Thomas Hearne wrote in 1733 that the Terrae Filius “exposed vice and immorality, and discovered the flagrant crimes of many loose Academicians, particularly the abominable acts of some Heads of Houses”. Hmm, would “loose Academician” fit the reputation of any Management Gurus you know? Terrae Filius Lancelot Addison was forced to apologise on his knees for speaking on the subject of pudenda illa obscenitate (or what Shakespeare, called ‘country matters’ in Hamlet), but I suspect it would have been worth it. I wonder what our Management Terrae Filius would say of our modern day management gurus? The diarist John Evelyn did not find the performance in the Sheldonian Theatre in 1689 at all funny: “In my life I was never witness of so shameful an entertainment.” I wonder whether it was the performance of the Terrae Filius that was truly shameful, or the academic behaviour that inspired it? All of this performed below the painted ceiling by Robert Streater which depicts Truth combining with Arts and Science to dispel Ignorance. That sounds like a great definition of management, shame some of the big guns missed out the ‘Truth’ bit. This entry was posted in opinions and tagged management, MBA, strategy, theory. Bookmark the permalink.